Before I jump into my practical, personally-tested, and occasionally odd tips for working parents, I thought I’d provide some context. The concept arose from a well-meaning, but off-base program from my healthcare company intended to help me improve my well-being by, among other things, reducing stress. But it all went terribly wrong. Are you kidding me? I can tell you, definitively, that this does not lessen my stress. Instead I have been reduced to someone who yells “Stop nagging me!” at their phone in highly public places. But they are all things I’ve actually been able to do. Use them – or ignore them – as you like. I promise you I will send you no reminders. Tomorrow….B is for Buffet. And no, I don’t mean dining out. W is for What Was I Thinking? 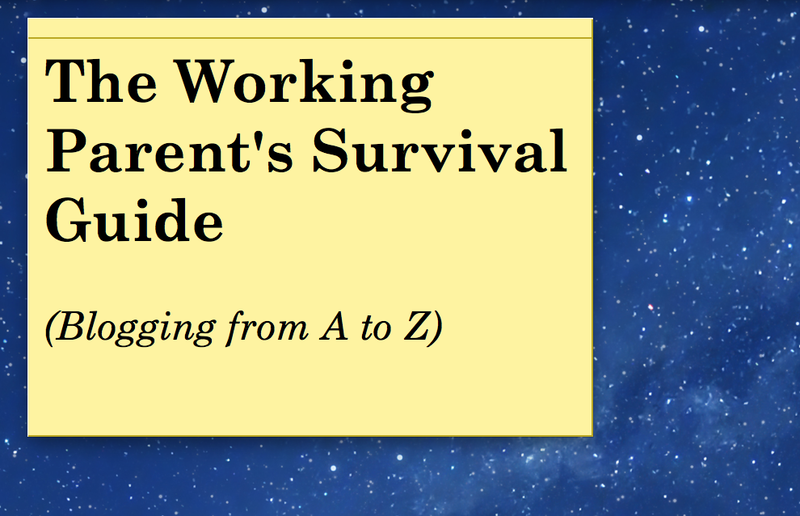 This entry was posted in Blogging from A to Z, Family, Household management, Parenting, Work and tagged #AtoZchallenge, humor, life hacks, survival tips, working parents by Sarah Day. Bookmark the permalink. I’m excited to read these! I always love when people tell me I should relax. Um… I don’t have time to relax! Okay… maybe I do, but it certainly doesn’t feel like it. I hope they help…I’ve had people advise me to lower my standards, but honestly, how low can you go? Cristina, I’m sure you could teach me a thing or two! You’ve been at this longer than I have. What kind of tea will you be drinking? Green, ginger matcha in the afternoon and a blend of black and jasmine in the morning. Serious business here!